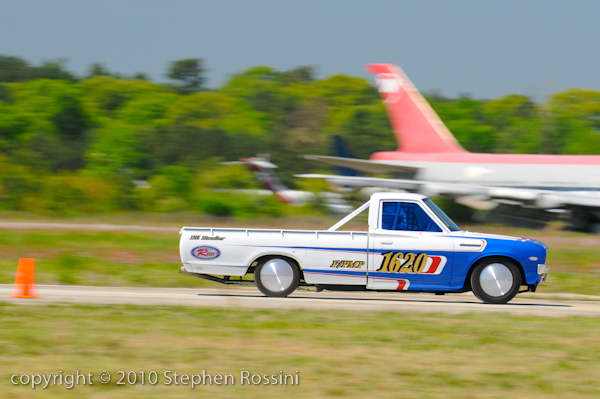 For my 1 year anniversary and 100th blog post at MyRideisMe.com I share with you a classic Japanese land speed racecar, err… truck, a Datsun 620. I spotted it on the Japanese Nostalgic Car blog/website HERE. If you don’t have this on your blog reader, go ahead and add it now. The picture credit goes out to Stephen Rosinni, a professional photographer out of NY. According to JNC’s blog post, the Datto truck belongs to Barry Brown of Riter Automotive and was run at the Maxton Mile recently. It runs in the F/PMP class (F = 2.01 – 3.0 liter, PMP = Production mini/mid pickup) with a 2 liter that makes about 220hp equipped with Nissan 50mm race carbs and a Nissan 5 speed. The #1620 truck broke the class record of 119mph by running 123 in the standing mile. The Riter Automotive crew, out of Rochester, NY, plans on running at Bonneville this year. Hopefully we can bring you all some more pics and details. Of course, when it runs at B’ville, we’ll hopefully bring you news of another broken record. I was curious, so I checked out the BNI class record for F/PMP. There you go boys, 132.072 MPH is the record to beat. At 123MPH in the standing mile, it doesn’t seem out of the question that with the right gear set and tire, this little Datsun could go another 10+ MPH with another 1 1/4 miles run up speed. I really dig the scallop paint job. Also, notice the smaller diameter rear tires compared to the larger front tires. For a standing mile, you need to get going quick compared to Bonneville where you are allowed distance to stretch your hot rod legs before the timing starts. I wonder if they will just swap the tires from front to back to run at the Great White Dyno. p.s. Here’s to another year and the next 100 posts. Man this is fun! Yea..that paint job would look sweet on the father in laws 76 Corolla….hmmm. I wonder how well the SHO Ford Ranger would stack up against that?